One of the problems facing breeders of pedigree dogs is the lack of diversity in a closed gene pool. Restricting the gene pool artificially by, for example, not breeding from Rhodesian Ridgebacks which don't feature the classic fiddle-shaped spinal ridge of reversed hair, or refusing to recognise certain colours which actually exist in a breed's gene pool, is not always wise. Many colours in the coat colours of dogs are in fact dilute black and solid white can often mask other components. I find it illogical and unjustifiable to try to remove from the gene pool some of the natural coat colours in a breed. Quality not coat should decide breeding material. White-coated dogs are paradoxically both preferred and discriminated against in the world of the showdog, with glamorous breeds like the Samoyed and the Maremma Sheepdog being prized because of their magnificent white coats whereas a solid white coat in breeds like the Boxer and the German Shepherd Dog is not desired. The nearly all-white Rough Collie is favoured in America but not here. I see many mainly white working sheepdogs but I doubt if a show ring Border Collie would get far in this hue. The celebrated vet and writer of the 1900s Frank Townend Barton once bred a white pup from purebred Bloodhounds, perhaps a throwback to the Talbot hound, but consigned it to the bucket fearing a misalliance, to his subsequent regret. Breeders of Kyi-Leos, Canaan dogs, Akitas, Pomeranians, Chow-chows, Pekingese and Polish Lowland Sheepdogs often have strong views on white coats in their breed. White is the natural colour for Pomeranians; the original bigger white variety, rather like the Japanese Spitz and Volpino of today, was a most beautiful dog - now lost to us through human whim. 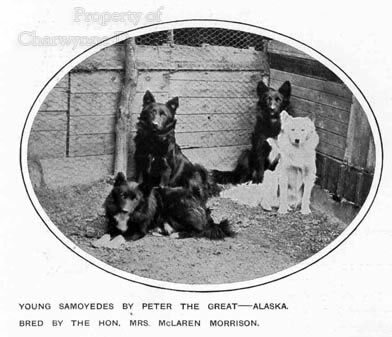 Colour-prejudice in pedigree dogs is widespread yet admits to no rhyme or reason, with the parallel desire and distaste for all-white shepherd dogs aptly illustrating this conflict. For a fancier to opt for a colour other than white in his preferred breed is an exercise in personal choice. But for an approved breed standard to exclude or frown on white as a colour is somewhat dictatorial and can so easily consign an otherwise excellent white pup to oblivion. Where is the logic in white being encouraged in the Maremma, Kuvasz, Komondor, Pyrenean Mountain Dog, Owtcharkas, Schafpudel and Algerian Sheepdog but discouraged in some other pastoral breeds? Again and again, you can read the tired old theories about the white dog merging better with the sheep or the shepherd being able to see the white dog better at night or sheep not being able to tell a non-white dog from a wolf. Such theorists conveniently overlook the fact that most sheep are not white and that most flock-guarding breeds are not white either, like the Caucasian, the Anatolian, the Karst, the Croatian, the Fonni, the Estrela Mountain Dog, the Tibetan Mastiff, the Vikhan, the Powinder, the Bhotia, the Bangara, the Bisben, the Cao Rafeiro do Alentejo and the Appenzeller Mountain Dog, some of whom are actually wolf-colour. The breed standards reveal the irrational prejudice. The Pomeranian Sheepdog, now lost to us, was a pure-white German sheepdog. The dog acknowledged as the foundation dog of contemporary German Shepherd Dog bloodlines, Horand von Grafrath, born in 1895, had a white grandsire. But after the death of von Stephanitz, white dogs were discriminated against, leading to their disqualification in Germany and then in America in 1968 from conformation shows. One was however the top obedience German Shepherd in America in 1968. In 1978, a white dog was the top dog in the US police canine association and a white Canadian GSD police-dog has been credited with over 200 arrests and rated highly. I can find nothing but admiration for the white GSDs in the Hoof Print kennel of Joanne Chanyi in Ontario; why should such admirable dogs not be acceptable? In the hound world similar prejudices are found. In his most valuable work, The Encyclopaedia of Rural Sports of 1870, Blaine wrote that: "A pure white hound was in great estimation by some of the older sportsmen, not only for its beauty, but because these dogs were considered most excellent scenters. This preference for pure white hounds is not however in accordance with our own observations on these dogs generally for experience has shown that the lighter the colour the more tender are the skin and feet." I doubt if modern Saluki fanciers or the admirers of the great white hounds of France and the Talbot hound would necessarily agree. Although, the Talbot hound was not solely white; the coat-colour varies on the different heraldic symbols of the Talbot/Shrewsbury family, a black and a flecked hound being featured as well as the better-known white. The sight hounds can be found in any colour but in many scent hound standards the phrase "any recognised hound colour" is used as guidance. But I don't see many all- white Basset Hounds or Beagles. Yet when hounds are portrayed in Egyptian, Greek, Roman and European medieval art, the hounds are usually all-white. The Dogo Argentino, very much in the mould of the 14th century alaunts, is probably the only pure white smooth-haired par force hound remaining...more's the pity! The terrier world reveals human whim being thoroughly indulged, with the colour of the coat sometimes being the basis of the breed. Because of the Westie solid white is not allowed in Cairns but is acceptable in Smooth Fox Terriers, although I have never seen one in the show ring. 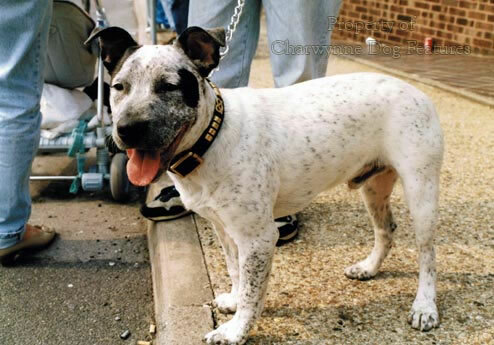 In Bull Terriers, tick-markings in a white coat are undesired but in Staffords white is permitted as a solid or part colour without the former being favoured, or so it seems. Does the breeding of terriers actually benefit from such exercises in human whim? Do we not value the top-class white working Lakeland Terriers of Gary Middleton because of their colour? Are we truly not going to prize the blood of say Bob Truman's field trial champion but mainly white Gordon Setter because of its colour? Should we not treasure the genetic diversity offered by a fawn Schipperke, a mainly white Great Dane or a black Bedlington Terrier? We are free to breed from a Whippet of any hue. But if a black Boerboel crops up in a litter, do we just cull it? This is rampant prejudice not dog-fancying. 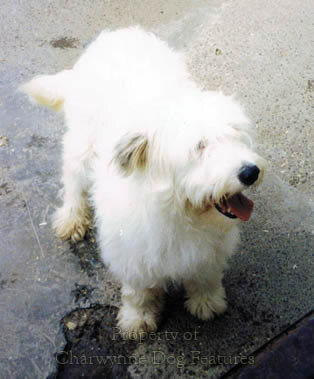 The late Brian Plummer, terrier-breeder, lurcher expert and country sports writer extraordinaire, once succeeded in breeding a solid white Bearded Collie from a mating between two merles, a blue-eyed dog with no signs of albinism, dwarfism or deafness. But he was the last person to be deterred by convention, prejudice or perpetuated bias. Burns (1952) suggested that the true albino may be blue-eyed, but Little (1957) indicated that this was incorrect. Robinson (1990) reported that: "The homozygous merle is white or almost white, with patches of coloured hair on the head. Some individuals develop into fine dogs, but the majority suffer from one or more defects. These include blue iris colour, deafness in one or both ears, and reduction in size of the eye, even to the point that one or both eyes may be absent. In general, it is advisable that white merle animals should not be bred." Whitney (1947) writes that: "Inbreeding blues (i.e. blue merle collies) for several generations often so dilutes the color as to result in a white with very little blue present and the blue in these cases will again appear last on the ears of such an animal. This has led white breeders to seek type through the inbreeding of blues, but the results have never been satisfactory..."
None of us wants to breed albinos, perpetuate congenital deafness or dilute the desired colours in our favoured breeds. We all like to see good pigmentation and strong colours in our dogs. There is no harm in preferring certain colours in pedigree breeds, especially where the coat-colour establishes 'type', as in red Irish Setters, Dandie Dinmont Terriers, Golden Retrievers, yellow Labradors, West Highland Whites, Kerry Blues, Wheaten terriers, Vizslas, Weimaraners, Dalmatians, Sussex Spaniels and Blenheim Cavaliers. But soundly-bred otherwise good all-white dogs should never be put down just because of irrational human whim or show ring decree. Their blood may be genetically important and surely even out of plain good sense there is no bad colour for a good dog. 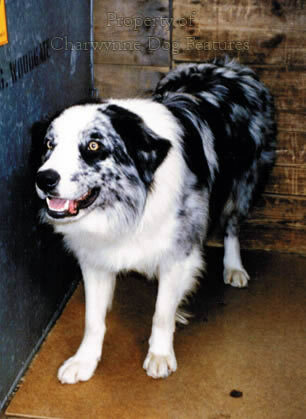 In his Practical Genetics for Dog Breeders of 1992, Dr Malcolm Willis writes: "...breeding for a specific colour limits choice, forces you to use animals on the basis of colour per se and though other features may be considered the very 'rarity' of the colour chosen means that when you find it other qualities may be less than perfect. In the long term the quality of animal will inevitably decline. This will apply to any breed. Do not breed for colour..." We ignore the advice of geneticists and we imperil our breed. 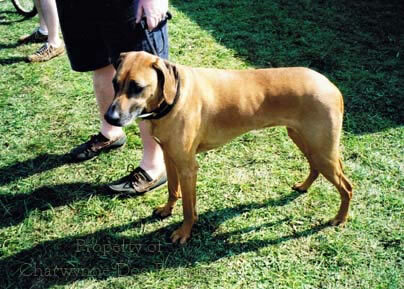 Surely too, a truly outstanding Rhodesian Ridgeback not featuring the ridge, is a much better dog than an inferior ridged specimen. Are we truly seeking to breed the best dogs or the best coat?